Okay, people, this is our last week before the holidays officially kick off. What?!? This means that my tree will go up NEXT week. Yes, I put my Christmas decor up the week of Thanksgiving, but somehow I am in denial. For some reason, I am just not ready this year and still feel like summer was just a few weeks ago. How did we get here? 1. Do we see a pattern in these pictures? Antlers. And more antlers. Listen, I know just as much as anyone that horns, antlers and animal mounts are "in" at this moment and time, but I never thought they would end up in my bedroom. (Picture to the right). Compromise is part of marriage, right? I will say, I am loving how our home office turned out. I got the majority of the display pieces at Hobby Lobby and on Etsy. 2. I lit up my Scentsy burner with a little apple pie goodness. Ross walked in the door thinking I was actually baking one. He should definitely know better. 3. Found this picture while I was cleaning this weekend. Dear Lord, thank you for allowing me to grow into my fat head and bringing back the design in this sweater. My dad was cool even back then. I wish he still had it. It would SO be mine! 4. Happy snail mail day. These beauties came in the from Shop Gallery Style. Definitely my new favorites. 5. Hanging out with some of my best friends in the whole wide world for a little college football. Too bad my alma mater, Texas State, lost. What a game! BUUUUUUT, how about the Texas Aggies? Texas boys showed Alabama, the #1 team in the nation, how it's done. 6. I didn't actually make it to church on Sunday, but did watch the service online. I swear, I paid more attention at home than I typically do when I am actually present in the congregation. It was an amazing message on HONOR. Honoring the church to be exact. I was reminded to take notice, take hold, take action and take off. Amen. 7. Sunday wearings. Not much to say here except that I felt a bit like a yellow canary. 8. I hope everyone took time out of their day yesterday to honor and show their appreciation to a U.S. military vet or someone currently serving. My hero is my dad. He was a marine in Vietnam. I could not be more proud to say that I am a daughter of a man who fought for our country and put his life on the line for us all. I love you, Daddy. 9. And then, wrapping up the hodgepodge weekend came the game of the season. Both teams had a record of 7-1. I have never seen so many turnovers in one game in all my life. My throat is a little sore today. Yes, I am THAT girl. 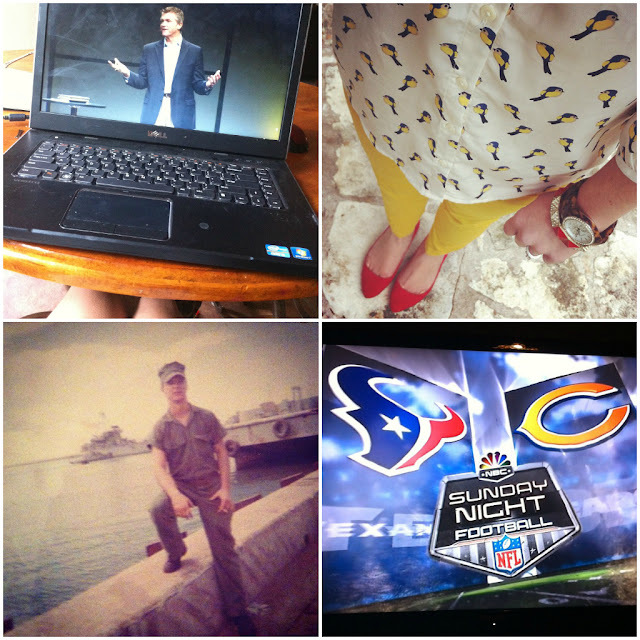 I will always be that girl when it comes to the Houston Texans and San Antonio Spurs. We pulled the win and are now officially the BEST team in the NFL! In other news....I decided to take the LEAP and host my very first link up this Wednesday. Start thinking about some randomness. What's on your mind? Anything and everything goes. Did you see the latest giveaway? 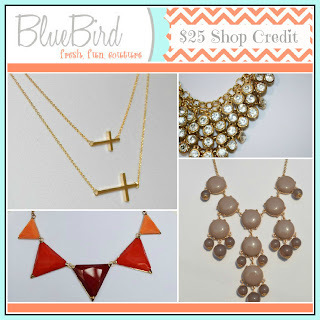 You could win a $25 shop credit to Blue Bird. Daddys girl here too and he loves that I'm always the first to call him on Veterans Day! Love the canary outfit!! 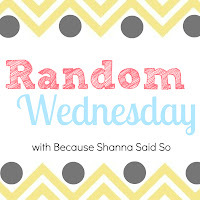 YAY for Random Wednesday linkup! That photo of you is SO cute! And your dad was definitely stylin' in that sweater :) Love your arrow bracelet Shanna! I so feel you on Christmas, people are posting days left on Facebook and every time I see it I have a mini panic attack. I just took down my Halloween decor...wtf. On to the antlers, I have a feeling our men folk would be good friends. And that bird shirt, I have an obsession with. 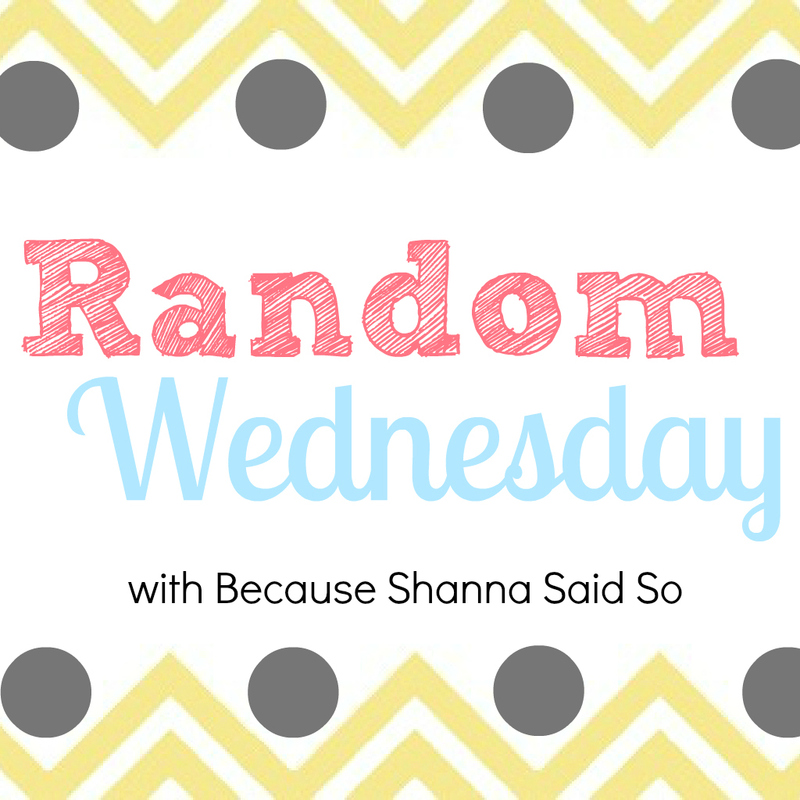 I'm so linking up for your random Wednesday... I think we are having a Vlog linkup too if you want to increase the randomness! I would TACKLE YOU for that sweater your dad has on!!!!!!! This might be a new focus at the thrift stores! I am totally addicted to scentsy too - they have the best smells... and same here! I resisted the urge to put my Christmas stuff up this weekend - the holiday decorating can't come soon enough! Okay..I already have my post for Wednesday written, but I'm going to try to add in a little randomness! Oh...and I am headed to the post office and popping your earrings in the mail today!!!! Yay! Loving your arm party and the yellow pants! I seriously can't believe Thanksgiving is next week! I am laughing at the pie candle story. SO funny your hubby thought you were baking one! lol I am also loving that bird print top - been trying to find some quirky patterned tops but haven't yet. What a wonderful weekend my friend! I just love all of the antlers!! You did a fab job on the office and those antlers in the Master are pretty too! Our Aggies had me on the edge of my seat in the 4th quarter!!! I'm still glowing :) Love your arm party too! THANK YOU, THANK YOU, THANK YOU to your daddy!! My husband is a Marine too and fought in Iraq. All service members, and especially Marines, hold a very special place in my heart! I cannot wait for your link up!! It is going to be fabulous!! Have a great day lady! Love ya! Sweet link up, I'm in! Looking forward to it. ok so my husband wants to put up horns and I was reluctant (we live in Dallas) so now bc you are so cool and stylish we can put them up. that love bracelet is so cute! we put up our christmas decorations thanksgiving week too! Thanks to your Daddy for his service! My Dad was in the Reserves, my uncle fought in Vietnam, my cousin is a marine, and my Papa was in the Navy and fought on D-Day -- so much respect for our military!! I'm loving the old pics of you and your Dad, precious. 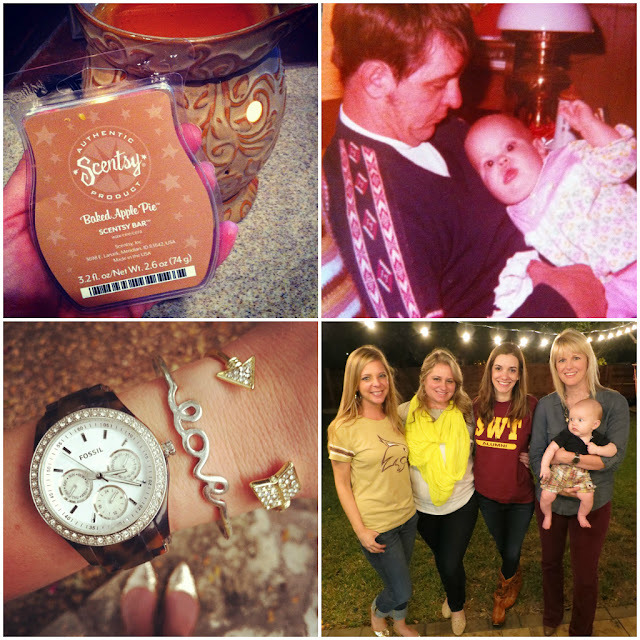 Love the antlers, love your arm party, love the birdie shirt! And yay for a linkup! Have a great week lady! I love those key wall decors. Did you get those on etsy? I have been desperately trying to decorate our staircase wall. So far I have 1 thing... oops. I've seen that church service on TV! He is fantastic! I stumbled across him one morning and he was talking about relationships in the most concise, perfect way. I hit record. He's great. And I am so impressed with your dad! HUGS to him!! xo! You were such a cute baby!!! I love the canary outfit too - what can I say, yellow is my favorite color! And the antlers surprisingly work in the bedroom. Who knew?! I can't wait for Wednesday!!!! So excited!!! I was going to put my tree up this weekend but my children got sick. It will happen this week for sure though! Love that your hubby thought you might actually be baking a pie lol... What church do you go to? I'm looking for one of my own! I honestly have never liked antlers as decor but I am loving what you did with them!! Your dad really is a hero. Love that old picture of you 2. That yellow canary shirt is fantastic!!! I'll be linking up with you this Wednesday! oh that bracelet is super cute! I love so many things about this post - the antlers (I will sneak some in somehow...target has some small ones...), the non-apple pie baking, your giant head. Once I get my groove back I will be linking up! Thanks for introducing me to Shop Gallery Style! And loving that bird print top! So excited for your first link up. I need to start writing down my randoms! So excited for your first link up! I'll definitely be back. Also, have you seen the site Dads are the Original Hipsters? Because your picture of your dad totally made me think of it, haha. Yay! Excited for ur new linkup! I love you in yellow pants! You always put the cutest tops, shoes & accessories with the color!!! And shanna PLEASE don't be worried about messy project. I am not worried at all. I never would've picked the item if I didn't think I had amazing girls. You've got this trust me!! LOVE those bracelets. i need them. I love the antlers...it's so Texas :) and I convinced my husband to let me buy and use a pumpkin candle since he dosen't like the smell for some weird reason....it smells heavenly!! And I wait til the last weekend of Nov to put up Christmas deco...I just want one holiday at a time and my husband made an analogy that Thanksgiving has "middle child syndrome" becasue it gets overlooked kind of in terms of holidays and decorating haha Love your sunday outfit!! 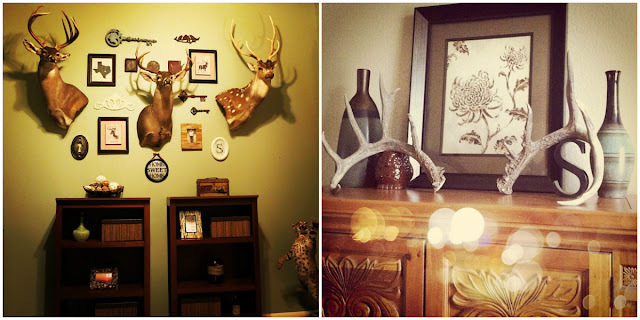 I utilize a lot of antlers in my decor so I'm loving your pics and the trend! I can't wait wait to put up my Christmas decorations! Also love those bracelets - so stinkin cute! Yay for your first link up. I cannot wait!! I love everything about this post but that last photo. That game of the season just did not end as it should have :). Love your blog girlie! So darling. Okay, so do those Scentsy (sp?) things smell good for a long time? I had something like that, and it seemed like the smell burned down before the wax did. I've heard good things about scentsy though...I need to try it!